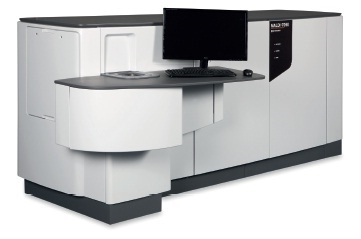 The MALDI-7090™ is targeted for proteomics and tissue imaging. It combines Shimadzu’s extensive MALDI TOF-TOF mass spectrometry expertise with novel patented technology to provide ultimate performance in identification and structural characterization of biomolecules. MultiPlex maximizes the efficient use of the MALDI-7090 through the combination of the integrated 10 plate loader, the ultrafast 2kHz UV laser, and the MALDI Solutions multi-user software environment. Multiplex expertly manages the MALDI-7090 workflow: experimental set-up, data processing and results review is now possible from any workstation linked to the instrument network delivering a true multi-user interface.MultiPlex streamlines analyses by assigning specific plate locations within the 10-plate loader, monitoring the progress of the submitted experiments. Furthermore plates can be inserted into the loader while analysis of a separate plate is on-going further increasing throughput and ease-of-use. The MALDI-7090 includes a number of proprietary features to improve sensitivity and productivity. Wide Bore ion Optics : Consisting of unique wide-bore extraction optics, the MALDI-7090 ion optics are designed to maximize ion transmission and minimize source contamination over time. Ultra fast Laser : Shimadzu’s proprietary solid-state UV laser, designed specifically for the MALDI-7090, delivers true 2kHz acquisition speed in all modes. The added benefits of variable beam focus and long lifetime maximize reliability and broad-range applicability. HD sample viewing : The MALDI-7090 incorporates the latest state-of-the -art camera technology to deliver high-quality full HD color images of the sample with 10µm viewing resolution, software-controlled variable focus and long-life LED illumination. TrueClean™ : Optimal performance of the MALDI-7090 source is maintained using TrueClean - a novel and fully automated source cleaning process. TrueClean cleans the source electrodes by redirecting the UV laser onto their surface and desorbing any contaminant material. This method is highly efficient and does not require source removal or venting. The MALDI-7090 is equipped with a dual wire-grid high resolution ion gate.Compounds of similar nominal mass may produce MS/MS spectra that contain fragment ions from several precursors if not gated correctly. However, the high-resolution ion gate in the MALDI-7090 allows the individual gating of species close in nominal mass thus producing distinct fragment ion spectra. ASDF is a Shimadzu patented technology that enables unparalleled resolution in MS/MS acquisitions. Through correction of the axial spatial distribution of the ions generated, the mass resolution is significantly increased and becomes essentially independent of the laser power used to ionize the sample.With ASDF, the MALDI-7090 can achieve mass resolution of 10,000 FHWM – unobtainable through pulsed extraction and ion optics alone.